Oglethorpe County is adjacent to the city of Athens, home of the University of Georgia, and just a short drive from the popular Lake Oconee recreation area. We are situated about half way between Interstate 85 (the Commerce Outlet Malls!) and Interstate 20 to the south, which gives access to the Augusta area. We are a rural, historic area with lots of open space and several small (read tiny!) towns. Many of our citizens travel to Athens for jobs, medical facilities and cultural activities and, at home, enjoy a leisurely life style in a friendly, rural atmosphere. 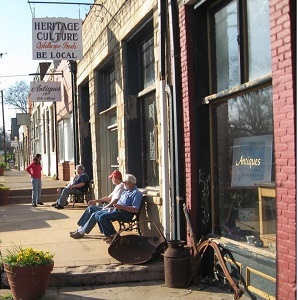 Here in the county, we have a lively music, art, and antiques scene in the county seat of Lexington, several national register historic districts and properties, parks and recreational opportunities. Our population is small (less than 15,000 )for one of the largest counties in the state. We have over 500 miles of rural roads and abut the mostly undeveloped Broad River and a state park on the northeast side and a national forest on part of the southwest side. Our close proximity to Athens ensures that we have access to all needed services and facilities. As older residents decide to move from rural to city living in order to access those services and facilities, it can be a smooth transition, enabling them to remain close to friends and family and to take advantage of all that is available. Includes Cities/Towns: Arnoldsville, Athens, Crawford, Lexington, Maxeys, Winterville. With our proximity to Lake Oconee and the Broad River, there are outdoor recreational events, hunting, fishing, horseback riding, water sports, biking, camping, and more available to residents and visitors. At the recreation center in Crawford there are ball fields,a swimming pool, tennis courts and walking trails. Being just a short drive from Athens and UGA gives our residents access to all the amenities of a large university: music, art, museums, educational opportunities, sporting events, and historic properties, as well as a lively downtown area with great restaurants. The Classic Center in Athens features well known entertainers, plays, musical events, etc. Here in Oglethorpe County we have several free concerts per year in Meson Park, a music venue in downtown Lexington that features local musicians, many from the famous Athens music scene, and our local arts group, Arts!Oglethorpe, puts on several musical and theater events each year. Art shows, both professional and amateur, are frequently mounted at venues in the area. There are many varied educational opportunities for seniors at UGA, Athens Tech, and OLLI (Osher Lifelong Learning Institute. Public transportation is available in the Athens area. There are bus facilities, taxi services and a regional airport with a shuttle to the Atlanta Airport. Other airports in the vicinity include a regional one in Greensboro and a small one in Washington. Jan 32.8 F° 42.2 F° 51.7 F° 4.8 "
Feb 35.2 F° 46.0 F° 56.8 F° 4.5 "
Mar 42.1 F° 53.5 F° 65.0 F° 5.0 "
Apr 48.5 F° 60.9 F° 73.2 F° 3.4 "
May 57.4 F° 69.0 F° 80.7 F° 3.9 "
Jun 65.2 F° 76.3 F° 87.5 F° 3.8 "
Jul 69.2 F° 79.8 F° 90.4 F° 4.5 "
Aug 68.3 F° 78.4 F° 88.5 F° 3.8 "
Sep 62.5 F° 72.7 F° 82.8 F° 3.5 "
Oct 50.5 F° 61.9 F° 73.3 F° 3.4 "
Nov 42.1 F° 52.8 F° 63.6 F° 3.7 "
Dec 35.2 F° 44.8 F° 54.5 F° 3.7 "
This region has not been identified as at risk for any natural disasters. Condos Over 50 Communities The county has affordable housing available and a low cost of living. There are some apartments, housing divisions, and abundant land for small farm living opportunities. Nearby Athens has condos, gated communities, assisted living facilities, apartments, and other facilities. Oglethorpe county is part of the regional system which provides training and jobs for seniors through the Athens office. There is a wealth of opportunity for volunteerism in the county: Chamber of Commerce, Rotary, Lions Club, historic preservation projects, special events, Arts! Oglethorpe, recreation activities, the schools, mentoring, art activities, the library, Community Christmas which provides gifts for needy children, scouting leaders, and other civic organizations and projects.